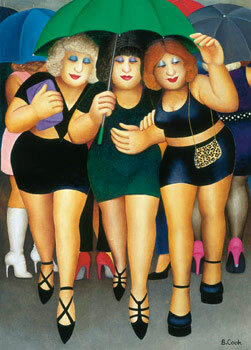 Although the wonderful Beryl Cook is no longer with us, she most certainly lives on in her popular postcard-esque paintings. 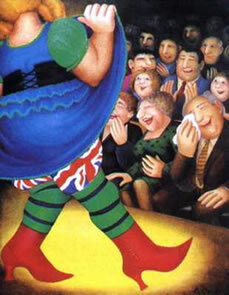 Cook was known for her portrayals of saucy, larger than life characters, often seen to be completely engrossed in their spit-and-sawdust pub social life. 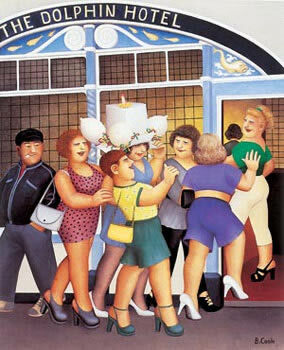 The â€˜largerâ€™ ladies and male characters that commonly feature in her work are inspired by the colourful characters Beryl came across in the Dolphin Pub, whilst living in the seaside town of Plymouth. In stark contrast her characters Beryl was a shy, modest woman. You could say that it was this dissimilarity that drove her to perpetually observe these larger than life personalities, as although Beryl felt she could never be this way in person, she could, in a sense, be a bit flamboyant and saucy through her art. 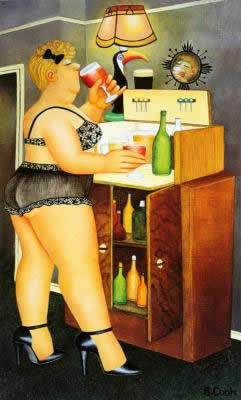 Her pieces are always full of colour and have fun titles that have the ability to make you giggle. You feel that you could walk into any pub in any British seaside town and encounter the characters Beryl is famous for painting. Her art is all about pleasure; her characters are always seen enjoying the guilty pleasures of nightlife, including booze, fags, and with a little imagination sordid chitchat and gossip. She was most definitely a talented woman that will be deeply missed by the art world and fans alike. It was their express wish that her pictures continue to be made available to the public. Our research shows that these lithographic prints remain the most cost effective way of owning high quality, large, collectable limited editions of her work. She was well known for painting slightly larger ladies on a night out on the town, in short, tight dresses as well as enjoying other frivolities. 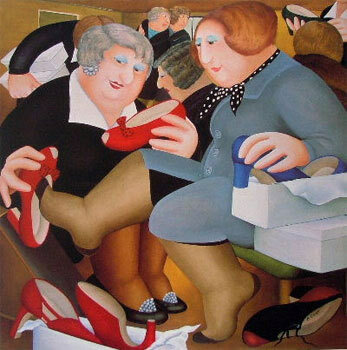 Beryl Cook’s humorous take on the human race created a very big following for this talented lady. She was been lucky enough to be on TV, had films made about her, was made an OBE and all because a friend who owned an auction in Plymouth persuaded her to sell some of her art in their shop! She was born in 1926 and did not show any artisitc talent in her youth. However, in 1943 she was a showgirl in a touring production called “The Gypsy Princess” and that, coupled with work experience in the fashion industry, was her inspiration and caused her fascination with the way people look and dress. This we can clearly see in her art. Later, while living in Plymouth with her husband, she used to go out to bars and clubs where they enjoyed watching the flamboyance of drag shows. This was another inspiration which has affected her style in her art work. 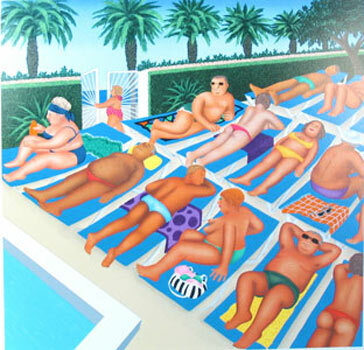 Beryl Cook’s work was first exhibited in 1975 and was highly successful. In fact, it was so successful that an article was done in the Sunday Times about her works shortly after, followed by a call from a London Gallery who offered Beryl her first ever London Exhibition, and the rest is history! 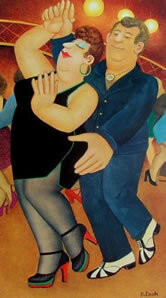 She has said that other artists that have inspired her work include Stanley Spencer and Edward Burra. Beryl recieved an OBE in 1995, and even contributed to the Queens Golden Jubilee exhibition in 2002 which was another great success for her. A film was made about her for The South Bank Show. 2 half hour animated films were made about her with an all star cast which was called “Bosom Pals” This also won some awards for Beryl. Also, in 2005 Channel 4 did a short film about her work, and in 2006 BBC featured her in a show called “Art School”. Sadly, Berly passed away in May 2008. But she lives on through her many fans and her sense of humour will forever be visible in her work. 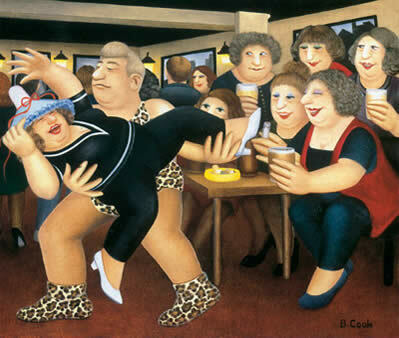 The rush for Beryl Cookâ€™s work continues as the public continues to pay tribute to one of the UKâ€™s most beloved artists by buying some of her signed limited edition pieces. 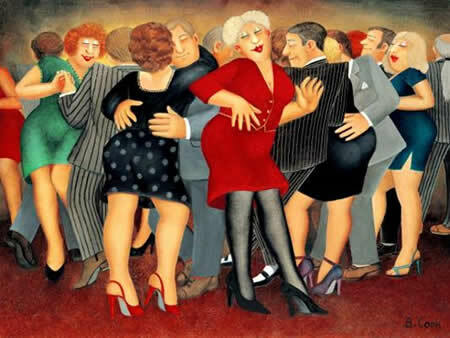 The cheekiness of her work is something that brought a smile to so many of us, she seemed to capture something very quaint about British peopleâ€™s lives and social behaviour. Although not as brash as saucy seaside humour, the type of which you see on postcards at British seaside destinations, there was still something very â€˜tongue in cheekâ€™ about her work. The scenes she painted, whether it be: a bar, a cafÃ© or a music room and the characters within them, we can all identify some of those characters in own lives, or maybe we see ourselves! The 4 lithographic images still available at published price are within this post, and make a good investment as all retail at under Â£300 (recommended retail price Â£282.00) and will be signed by the artist. Ill comment on her signed, Silkscreen, limited edition work and its investment value soon. Some of her recent Lithographic sell outs, such as ‘Full House,’ ‘In the Snug’ & ‘Strip Poker’ are already Retailing at Â£400 – Â£500 in some shops, quite a good profit if you bought recently!